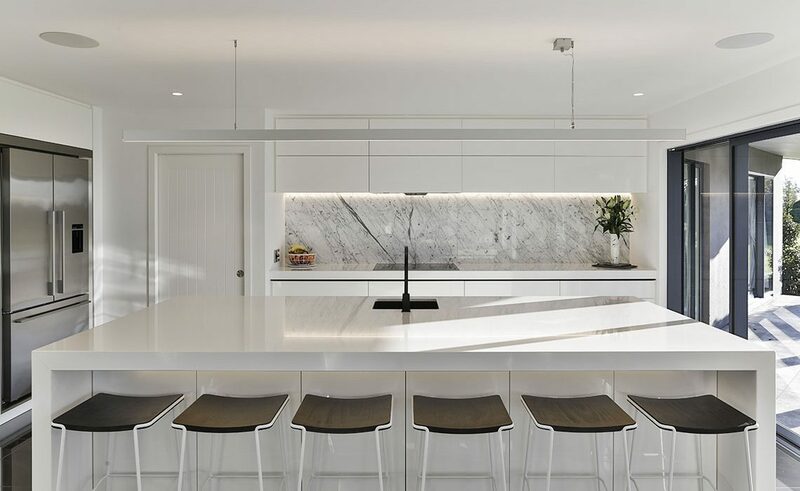 Less is more, is phrase that is often associated with the renowned architect and furniture designer Mies Van Der Rohe, putting forward the notion that simplicity and clarity leads to good design. 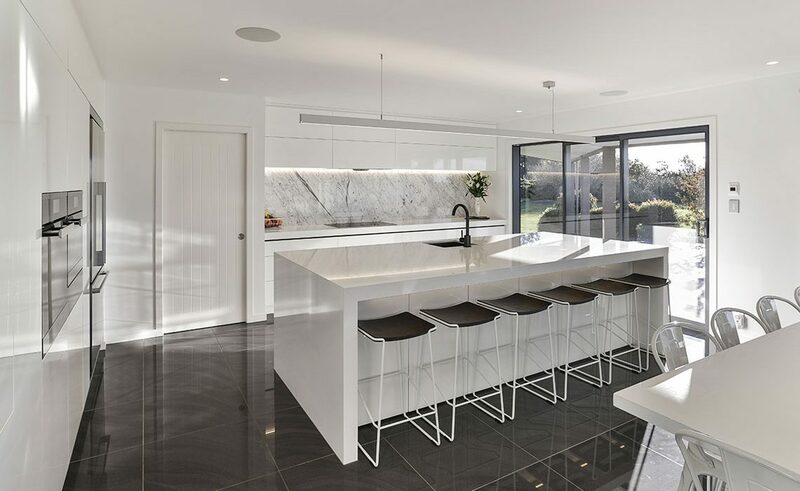 And when you look at this kitchen design by James Donaldson from Mastercraft Kitchens Ashburton, you could be drawn to the same conclusion. 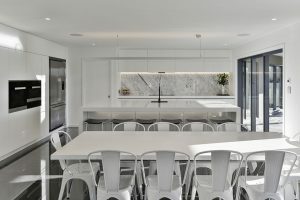 Clean lines, handle-less drawers and cupboards, and a monochromatic colour palette all add to the simplicity, yet hidden beneath its minimalistic façade are all the functions and practicalities of a large kitchen and scullery for a busy family of six. 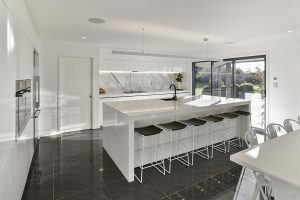 With four children approaching their teen years, the owners of this home wanted to expand and future-proof their kitchen for the next stage of their family life. 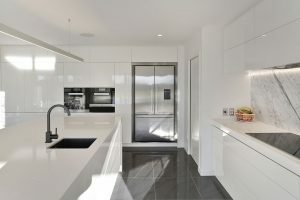 They also wanted a clean, contemporary look, with high-gloss, easy maintenance finishes. 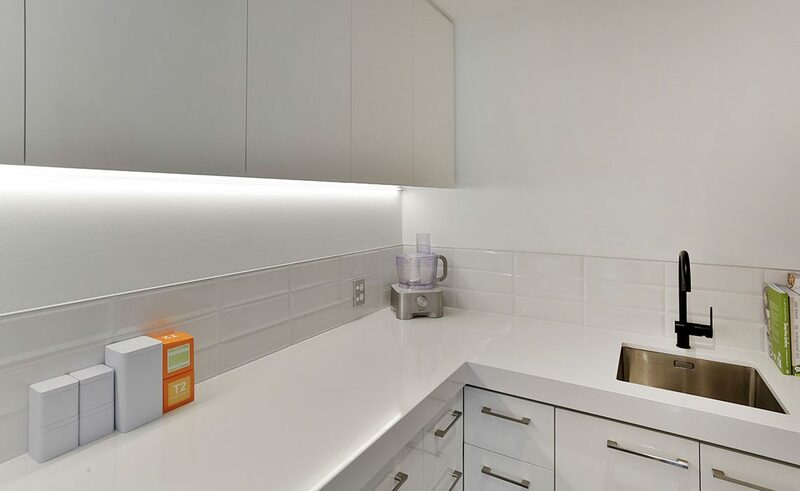 Working collaboratively with his clients, James says he came on board pretty late in the process, by which time they had a pretty good idea about what they wanted in terms of style and functionality, and had already chosen their appliances. 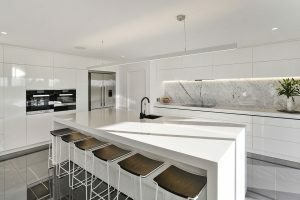 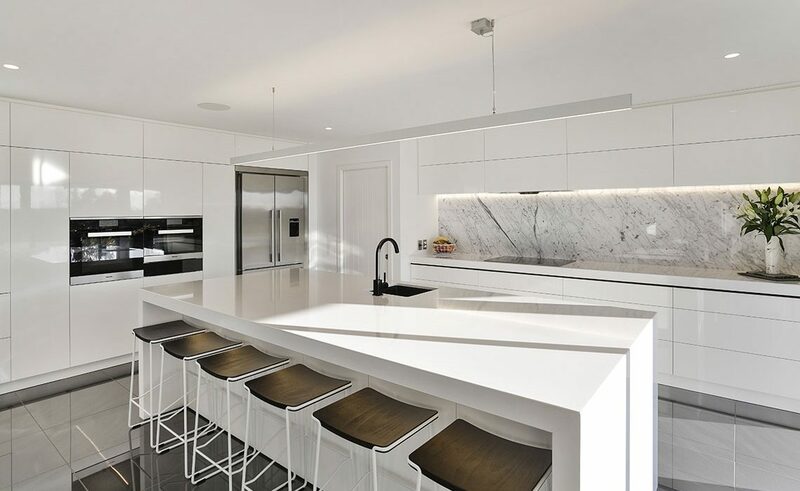 In keeping with the request for a minimalist look, the designer started with a predominantly white colour palette – Resene Alabaster high-gloss lacquer for the cabinetry, and Hanstone, in Royale Blanc, for the island and benchtops – an engineered stone that has the natural beauty of quartz with up to six times the strength and durability of granite. 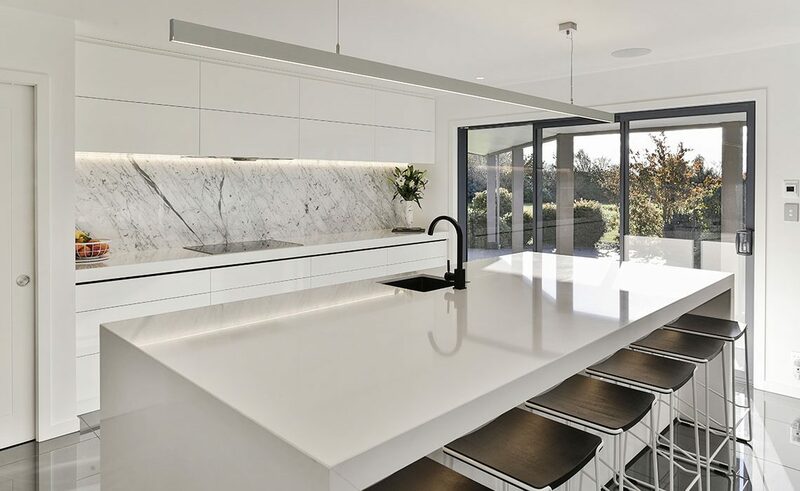 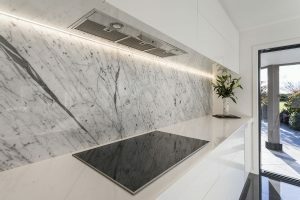 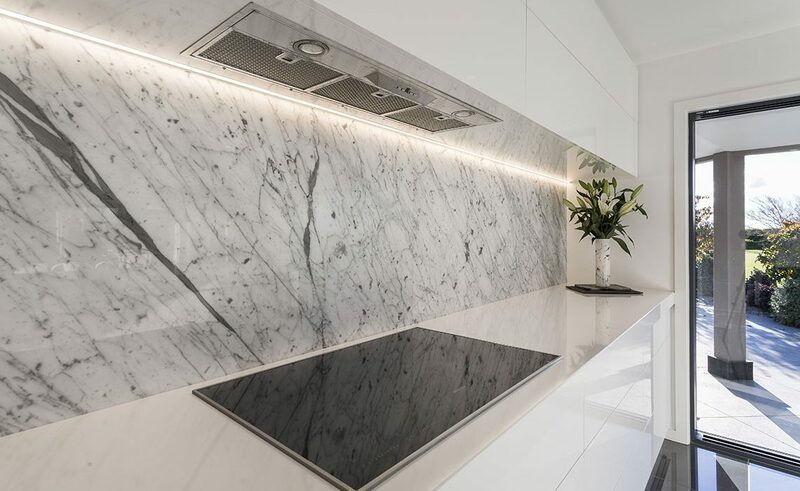 To add some visual interest, a heavily veined Carrara marble was used as a splashback – attracting the eye and giving the kitchen some movement along the back wall. 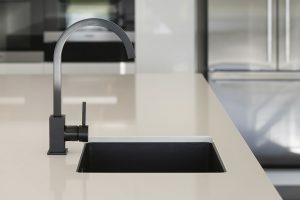 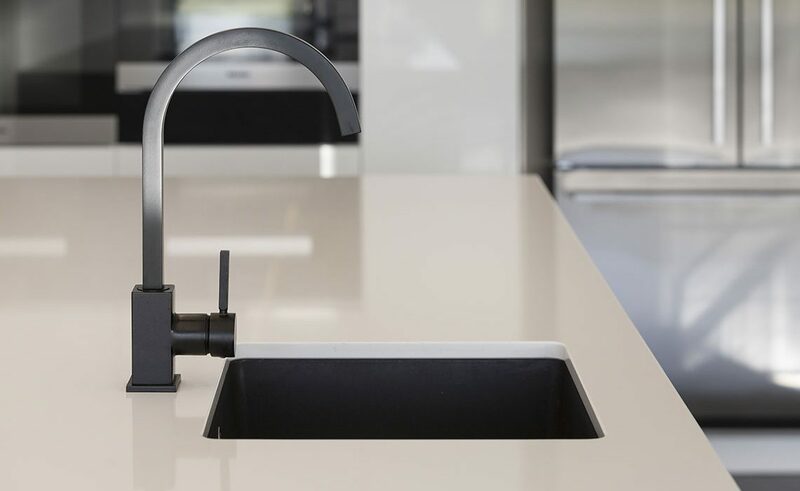 Picking up on the black veins of the marble, a black negative detail was introduced in the cabinetry beneath the splashback, and a black tap and matching sink was used on the island. 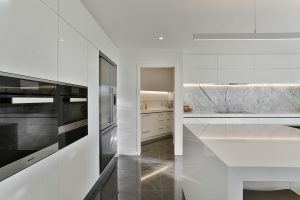 This also tied in with the black-fronted Miele ovens and a black-glass induction hob. 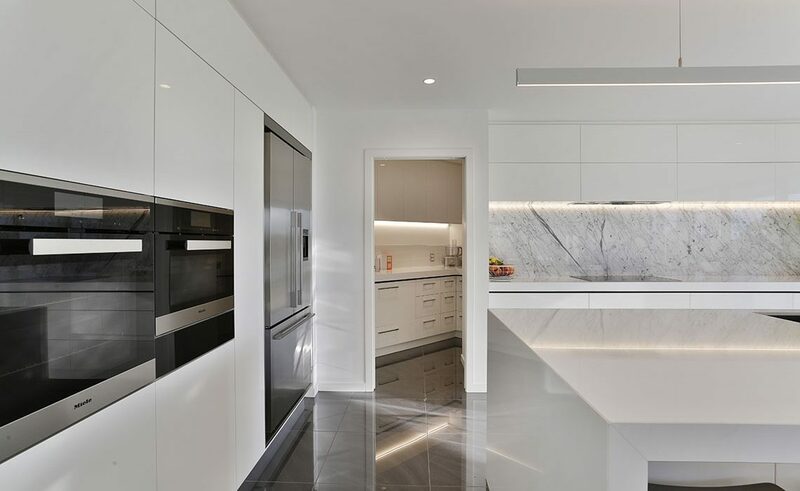 Large black floor tiles finish the look, with the high-gloss finish giving an almost mirror effect. 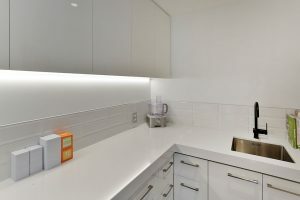 No handles have been used on any of the cabinetry in the main kitchen; instead James specified Blum ServoDrive (electric door mechanisms) to power all the cupboards and drawers – even the overhead storage above the cooktop. 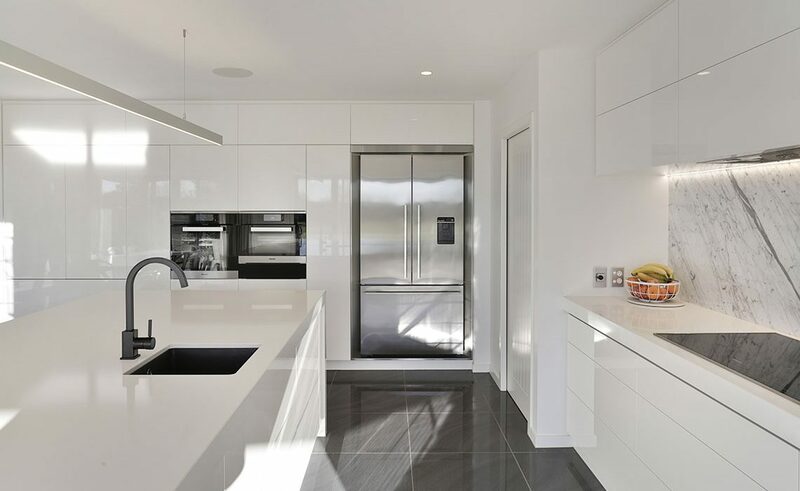 Along the side wall of the kitchen, a continuous bank of full-height cabinetry contains waist-level double ovens, plus a concealed breakfast preparation area that has a boiling water tap and space for small appliances, such as a toaster. 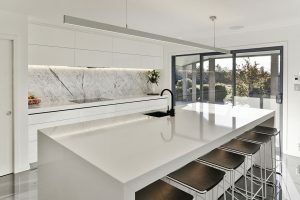 The centrepiece of the new kitchen is a kitchen island with a deep profile benchtop and waterfall ends that give it a very solid and permanent appearance. It’s big, too, with enough room to accommodate the whole family in one sitting – which is great for pre and post-meal conversations. 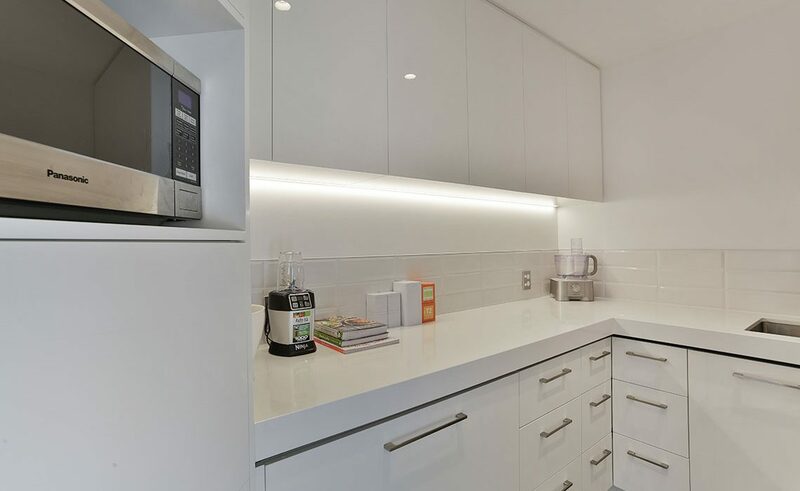 Tucked away behind a sliding door at the rear of the kitchen is a small, but very functional butler’s pantry that contains even more storage, another dishwasher, sink and space for small appliances. 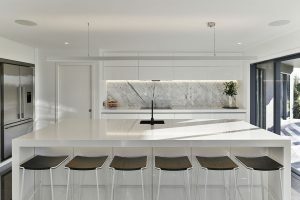 In accordance with the rest of the design, the lighting plan was minimalist with all the task lighting using an LED strip recessed into the overhead cabinetry, and a slick LED blade light hanging over the island benchtop. 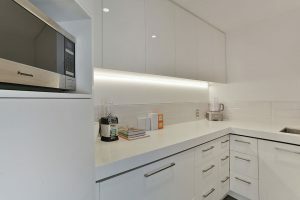 This kitchen was proudly designed, manufactured and installed locally in Ashburton by Mastercraft Kitchens Ashburton.